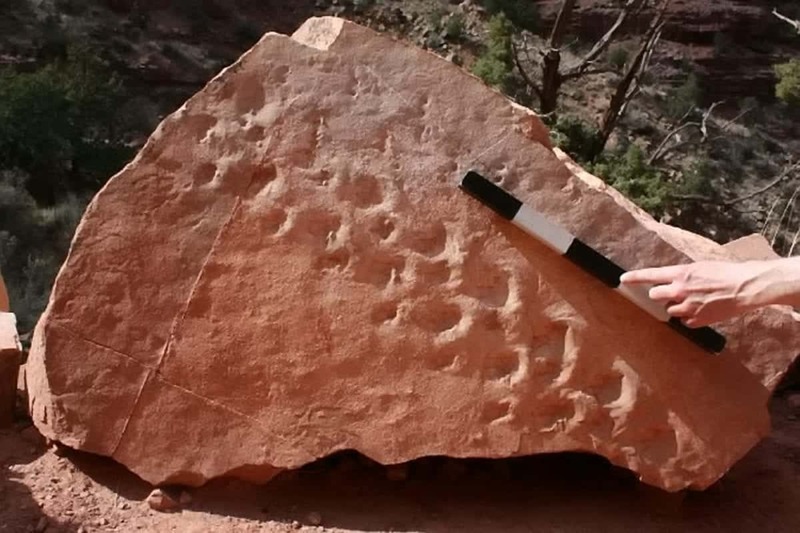 What could be the oldest footprints ever, of a lizard like-creature that roamed Earth 310 million years ago have been discovered in the Grand Canyon. Made by one of the first reptiles that ever lived the prints make it look as if the creature was line dancing. Scientists believe this means it could have been fighting with a rival or even engaging in an unusual mating ritual. The discovery only happened thanks to a cliff fall along the World Heritage Site’s most popular hiking spots. It sent a large boulder with the 28 indentations tumbling down. The sloping footprints were left on the rock’s expansive surface by a small animal about the size of a lizard. Reptiles are defined as animals that have scales and lay hard-shelled eggs on land. They arose 310 to 320 million years ago during the Carboniferous period. So the mysterious creature will be one of the first to walk the planet. Its arrival would have led to the first dinosaurs, the most famous reptiles of them all, which began to evolve 65 million years later. Prof Rowland, of the University of Nevada, Las Vegas, said they may be the oldest tracks ever found. He is still researching them. He told a Society of Vertebrate Palaeontology meeting in Albuquerque, New Mexico, that the fallen boulder now rests along the Bright Angel Trail in Arizona’s Grand Canyon National Park. He was first alerted to them in spring 2016 by a colleague who was hiking the trail with a group of students. The boulder ended up along the trail after the collapse of a cliff. A year later, Prof Rowland studied the footprints up close. He said: “My first impression was that it looked very bizarre because of the sideways motion. When he arrived home, he made detailed drawings, and began hypothesising about the “peculiar, line-dancing gait” left behind by the creature. Another possibility is the slope was too steep, and the animal sidestepped as it climbed the sand dune. Or, Prof Rowland said, the animal could have been fighting with another creature, or taking part in a mating ritual. Prof Rowland also believes the footprints belong to a reptile species that has never yet been discovered. Reptiles have an extremely diverse evolutionary history that has led to biological successes on land, in the sea and in the sky. These include the dinosaurs, the pterodactyls and giant marine creatures known as plesiosaurs, mosasaurs and ichthyosaurs. Prof Rowland hopes the boulder is soon placed in the geology museum at the Grand Canyon National Park for both scientific and interpretive purposes. He plans to publish his findings along with palaeontologist Dr Mario Caputo, of San Diego State University, in January.